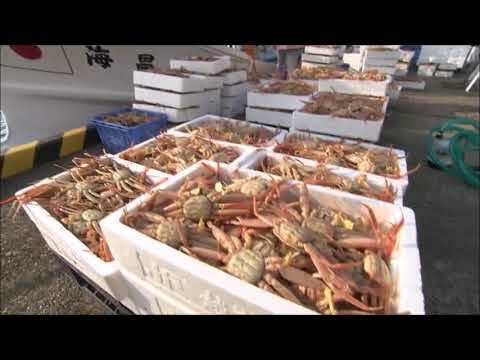 The season for catching “Echizen Gani” (crabs), luxury-brand Zuwai Gani (snow crabs) caught in the Sea of Japan off the Echizen Coast and landed in Fukui Prefecture, got under way on November 6. 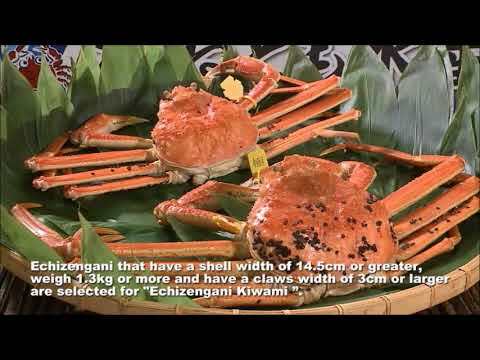 Echizen Gani, known as the only brand-name crab species presented to the Imperial Family, have yellow tags attached that certify their origin, and can be easily distinguished from other kinds of snow crabs. In particular, “Echizen Gani Kiwami” is recognized as a special brand of Echizen Gani crabs that meet extremely strict standards for their size. Those recognized as “Echizen Gani Kiwami” account for only less than 0.5 percent of the total volume of Echizen Gani caught each year. As the Echizen Gani-cathcing season gets under way on November 6 every year, a large number of tourists visit Fukui Prefecture to enjoy Echizen Gani called the “king of delicious winter food.” The Echizen Gani season lasts until March 20. Fukui Prefectural Government officials have expressed hope that people all over Japan and the world will visit the prefecture to taste Echizen Gani, which is a local specialty.